Navigable waters are usually owned by the state. States usually claim ownership of water bodies based upon the fact that they are navigable. This can affect ownership of minerals because states usually claim the minerals beneath navigable waters. One example of the complexity of the navigable waters determination is the complex series of lakes that was formed when the Great Red River Raft blocked the flow of the Red River. 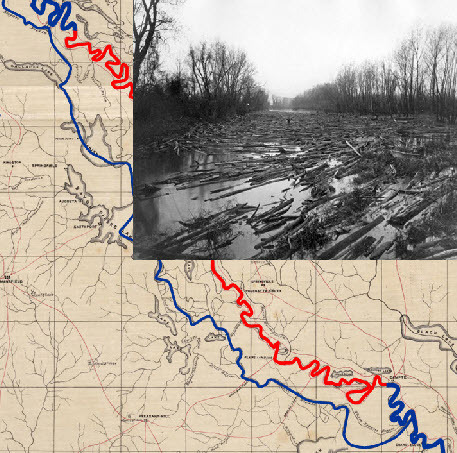 The blockage of the river by this 150-mile-long log jam caused the formation of many large lakes in northwest Louisiana. These lakes are called Raft Lakes. When the raft was removed in the 1800's by Captain Shreve and others, the Raft Lakes dried up. The state still claims parts of the beds of some of these lakes. Establishment of these boundaries requires determination of the ordinary high water marks of these lakes at the time of transfer from the state or federal government--a complex issue. The Haynesville Shale, one of the largest natural gas reserves in North America, lies below most of the raft lakes. Litigation has arisen regarding the ownership of the dried up lakes. Some of the gas wells beneath the lakes are capable of producing over 20 million cubic feet of gas per day. The Great Red River Raft as shown circa 1860. The Great Red River Raft blocked the Red River for approximately 500 years. Tributaries backed up and formed what are called Raft Lakes.